Trek to Dudhsagar would undeniably be a dream trekking place for all the trek freaks and it was on my bucket list since last few months. The team was split into 2 and the first group started walking away. (Let the reason for splitting into 2 groups be a secret within US). Megharaj had a tough time to make us stroll as we kept halting for posing the camera and got struck by magnificence of Dudhsagar. The big twist and challenge came to him, when he observed Kushal (who was an amateur photographer) went on with a few professional photographers (Not from our team). The professional photography team was capturing each and every move and it took a hard time to pull him back to our team. When we were about to cross the tunnel, a train came and all engrossed to the wall. It was mind-blowing to see the train passing inside the dark tunnel and sensing its vibration. Finally, We all reached at 4 PM and started building the tent beside the water fall (Just 100mts from the waterfall) and 5mts from Railway track. After a nice bath in the water, we came to our camping, prepared food and finished our dinner. It was an astounding to sleep inside the tent, listening to the shuddering train sound and water gushing. We all got up at 5 next morning and after preparing the breakfast the rain started cats and dogs. 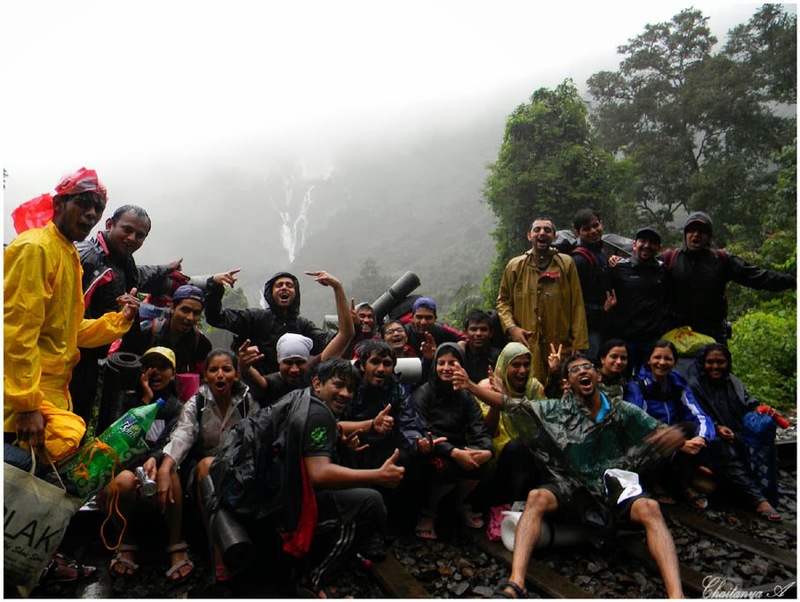 We packed all our tents drenching in the rain and started our day 2 trek (Another 10 KMS). 6kms in railway line and 4 KMS in Forest Route. After bidding bye to few people at Sonalium station who planned to visit GOA, we took the forest route. As we went deep inside forest, a wild animal stopped us and was staring at us. Since I was wearing a red-t shirt all perpetuated the myth that red makes bulls go wild and it’s going to attack you. Fear in my eyes, I pushed another person forward, but the bull took one step forward and we took one step backward. By the time, few other friends joined us, and on seeing a big gang, the bull ran away. We passed almost 5 streams and finally reached the station. We all took a train to Londa by 4:45 PM. We had to take General compartment, as there was no booking. A drunker who was sitting on foot board and taking snaps in his camera lost his balance and fell down from the running train. We tried to stop the train by pulling the chain, but as we already crossed 1 km we ignored. Now each and every tunnel which we crossed by our feet, we were passing by train. P.S: Trip to Dudhsagar would definitely a rejuvenating one.